The Belize Defence Force hosted an Energy and Water Conservation Policy Subject Matter Expert Exchange in Belize City May 8-10, bringing together Soldiers from the Louisiana National Guard and master planners from the U.S. Corps of Engineers. U.S. Army South was the lead executive agent of this U.S. Southern Command-sponsored professional military exchange. During the week, the Belize Defence Force hosted a variety of lectures and presentations on energy, water conservation and solid waste management while participants shared ideas, lessons learned and best practices. Belize is a nation prone to earthquakes, hurricanes and severe flooding. Service members from the Belize Defence Force shared their experience responding to Hurricane Earl in 2016 and the many challenges they faced. According to Lt. Audibaldo Monima, Belize Defence Force, Coast Guard component, a reliable source of clean drinking water is always a concern when responding to natural disasters and during humanitarian assistance missions – in addition to debris clearing and waste management. With rising energy costs and a variety of renewable technologies available, being proactive and having a solid energy and water conservation strategy in place not only reduces operational expenses, but can save money in the long term, according to Maj. Terry Vallarautto, Louisiana National Guard. Participants had the opportunity to apply some of the things that they learned during a site survey and facility assessment exercise of a military hospital on Price Barracks. With checklists in hand service members walked in and around the hospital looking for issues and areas of improvement including: lighting, insulation, caulking and water leaks. Soldiers from the Louisiana National Guard’s Construction and Facility Management Office provided their expertise of things to look for in addition to facility management strategies. A partner of choice, U.S. Army South recently teamed up with the Belize Defence Force during Beyond the Horizon 2017, a joint, humanitarian and civic assistance exercise focusing on bringing medical, dental, veterinary and eye care, to rural areas of the country. 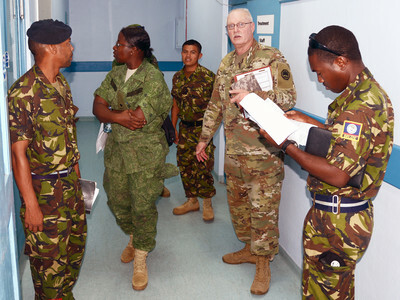 As the Army Land component of U.S. Southern Command, Army South works closely with partner nation armies and Defense Forces in Central, South America and the Caribbean to enhance security cooperation and strengthen inter-operability.